Children practice at the Celtic Keiki School of Dance, Music and Culture at the Atherton YMCA on University Avenue, top. Melissa Layden wanted her daughters to know more about their Irish heritage than just leprechauns and the wearing of green. So she enrolled Molly, 5, and Anna, 8, in Irish step dancing and culture classes offered through the Celtic Keiki School of Dance. "I'm a local Filipino girl," said Layden, who got her first dose of Irish culture attending the College of Holy Cross in Massachusetts, where she met her husband. "Practically everyone was Irish in college," she said. "The girls would get up and do Irish step dancing, much like how girls here do hula." The cultural classes provide something for the whole family, she added. "Not only are the girls learning, but we have something to do as a family on Saturday nights." Fancy footwork and catchy tunes certainly keep the kids focused as they learn new dance steps. Molly Layden wore a big smile as she was whisked down the line and twirled about. Kathleen Richmond's goals were similar to Layden's when she signed up her daughter, 5-year-old Caitlin Mariko, for the dance class. Caitlin is of Japanese, Irish and Scottish descent, her mother said. "We were interested in our daughter learning more about her Scottish and Irish heritage. ... Living in Hawaii she experiences so much of her Japanese culture in everyday life." Culture lessons and storytelling add so much to the learning experience, she added. "Our son Parker is only 18 months, but we hope to sign him up one day. My Irish mother-in-law will be thrilled." Corin Medeiros, left, Caleigh Mae Fabro, Tristan Fabro and Delia Fabro join hands as part of their routine. Lorraine Suankum felt disconnected from her Irish roots when she was growing up. As second-generation immigrants, her parents gravitated toward the dominant American culture. Held at district parks on Oahu. Cost is $25 per month; $5 for each additional family member. Classes are also taught at What's Up Gymnastics. Call 599-1738 for more information. "They listened to the Ink Spots, Temptations, and their idea of Irish performers were Bing Crosby, James Cagney and John Wayne," she said. "They had Irish heritage and pride, but not really the culture. Brooklyn and New York City were a far cry from the harsh farm life of the auld country." Suankum studied Irish dance but felt something was missing. "Not being brought up with it made the dance difficult to master," she explained. "Like the hula, there are certain undetected nuances that just aren't present if you are not exposed to the dance at a very early age. You can have two dancers do exactly the same dance and the one with the exposure to it will do noticeably better." Suankum decided to put her dancing shoes away for a while. "As I grew older, I enrolled in dance classes and saw after only the first class that the younger girls possessed something I would never cultivate -- authenticity. They had an abstract and innate understanding of step-dancing. Discouraged, I never took another class until I signed my own little ones up." Not wanting her daughters to follow her own path, she decided to expose them to their roots at a young age. "As soon as the girls could breathe, they were ushered into the world to an Irish tune. Their lullabies were ancient Gaelic tunes, their fairy tales involved leprechauns and nursery rhymes had a Celtic twist," she said. Suankum's daughters started taking formal dance lessons when they were 5. "My daughters took to the dance, music and culture like a fish to water. They caught on quick and kept up with it because Irish dancing, like our culture, is not a destination, it is a journey." Children show their Irish dance shoes. Suankum has finally found her own sense of authenticity and recently opened the Celtic Keiki School of Dance. She plans to bring classes to neighborhoods from Waipio and Wahiawa to Honolulu and Kailua. "Students advance at their own pace. They receive individual attention so they can begin anytime. We have an open enrollment," she said. The classes also cover history, stories and music, she said. "They learn the legends of Ireland, about mermaids and leprechauns." The school also hosts a CD lending library. 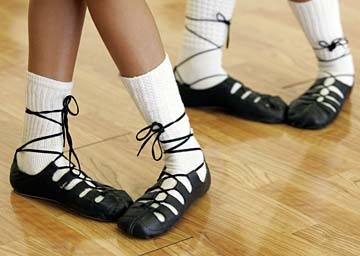 As far as dancing, though, instruction covers Irish step-dancing basics, timing steps, counts, jigs and hornpipe dances. The children also learn ceili and contra steps and are introduced to basic Irish phrases, history, music and instruments, such as the fiddle and penny whistle. It's not a competition, explained Suankum. "Some kids may just jump around and learn the timing. For the younger ones, it is great if I can get them to clap their hands at the right time. ... Our mission is to instill a life-long love of Irish music, dance and cultural activities." Suankum's twin daughters, Caleigh and Delia Fabro, now 12, help teach. The two have toured and studied in Ireland. "I've been dancing since I was a baby and sometimes forget that for my students this is their first time. I have to go way back to basics, like how to stand properly or hold your arms," Caleigh said. "The lessons aren't regimental and boring. They are fun." Callan Medeiros, left, Caleigh Mae Fabro and Delia Fabro are in step at the Celtic Keiki School of Dance, Music and Culture. The Fabro girls have also toured and studied in Ireland. Twice a month, the families get together for a potluck and contra dance so the children can apply what they have learned. "It makes me proud when I see them smiling and getting the steps right," she added. Mindy Connolly and her daughter Leilani Duong are diehard fans of the contra dance, held on the first and third Saturday of the month. "It's a good workout," Connolly said. "The music and step dance itself is so interesting. I keep bringing new people." "Teaching younger children feels natural to me," said Delia. "It's not like a class, it's more like a club. A culture club where the older children teach the younger, like we've done in our own family. We've taught our brothers Tristan (9) and Gavin (3), all of our cousins here and in New York and our neighbor's children how to contra-dance," she said. "When you join the class, you join our clan." Celtic dance is all feats of feet.